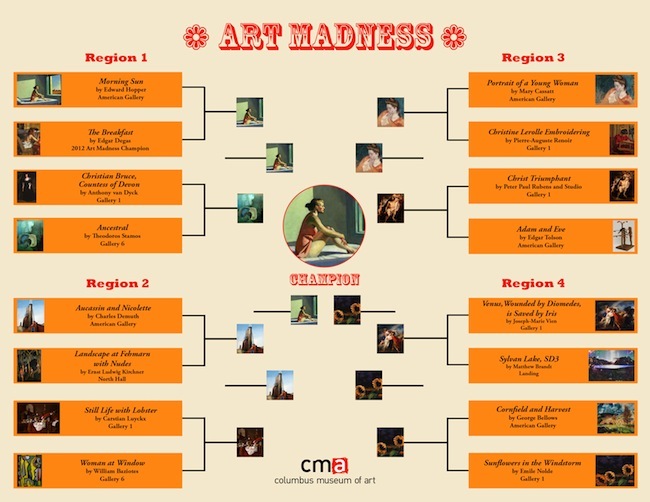 Thanks to everyone for participating in Art Madness, our version of March Madness for art lovers. American artists dominated the 2013 Art Madness. The Final Four matches saw Portrait of a Young Woman by Mary Cassatt vs. Sunflowers in the Windstorm by Emile Nolde, and Morning Sun by Edward Hopper vs Aucassin and Nicolette by Charles Demuth. Ultimately Hopper and Nolde prevailed to face off in the Art Madness Championship. And the 2013 Art Madness Champion is Edward Hopper’s Morning Sun. Unlike the closely fought Louisville – Michigan NCAA match, Hopper led all the way in the Art Madness championship game. We’re glad the Hooper is back home in Columbus, and clearly so are you. Find the Hopper in our newly reinstalled American Experience Gallery.